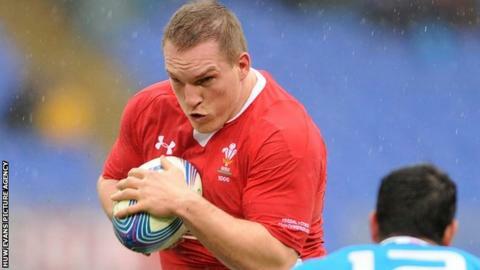 Prop Gethin Jenkins continues to be an injury concern ahead of Wales' Six Nations trip to Scotland on 9 March. The Toulon star is expected to be out for around 10 days according to the club's website. The French club said he will not play for them in their Top 14 match at home to Toulouse on Saturday. Jenkins, who has returned to Toulon for treatment, departed with a calf injury in the 46th minute of the 26-9 win over Italy in Rome on Saturday. The three-times Grand Slam winner and double British and Irish Lions tourist, who is set to rejoin Cardiff Blues in the summer, has a history of calf problems. "Gethin is back in France so we won't know more for 72 hours," said Wales skills coach Neil Jenkins. "Hopefully we will get the full extent of where he is and what the injury is." If Jenkins is ruled out Wales have Bath prop Paul James to come in on the loose-head. Jenkins, 32 and with 97 Wales caps, missed the 2011 World Cup opening defeat by South Africa with a calf injury. The five-times capped Lions Test prop left the Blues in the summer of 2012, but has struggled to hold down a first team place, with England prop Andrew Sheridan the first-choice loose-head in Toulon. But Jenkins played a key role in Wales recording a fourth successive Six Nations away win for the first time since the championship began 13 years ago. Wales are without locks Bradley Davies (ankle) and Luke Charteris (knee) and fly-half Rhys Priestland (knee) throughout the tournament. Flanker Dan Lydiate could return by the end of the Six Nations.